Oi, Earthling! Big trouble is coming your way! The people of Earth (that’s us) are in danger. HUGE danger. More than you can imagine. Double – no, triple what you’re thinking! It’s to do with a shadowy figure, a dark tower and some nasty monsters. Oh yes: and clanking metal robots, and people who are just like you, but not like you at all. Scared yet? We hope so. Because the more you read, the more danger you’re in. (Not only the danger of laughing yourself to death.) That’s the bad news. The good news is, Hamish is here to save us. Right? 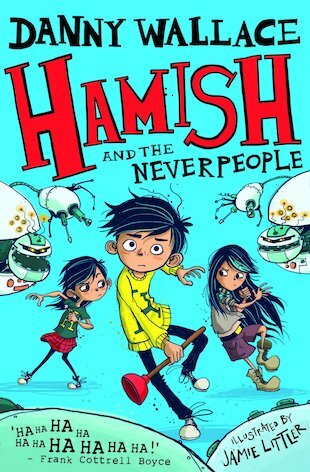 Errr – Hamish, where are you…?